We are committed to providing sleep help to parents worldwide, regardless of circumstances – and that means offering plenty of free resources! From our free sleep e-Books, to our sample schedule templates and schedule-maker, to our weekly blog articles, we offer a variety of free sleep resources on a wide range of baby and toddler sleep help topics. Take a look below! We know how exhausting it can be when your baby or toddler just won’t sleep. Most parents’ top goal is to help their little ones learn to sleep through the night quickly, with minimal tears. Our free baby and toddler sleep guides are designed to do just that! Learn our top 15 sleep tips, 5 ways to help your child sleep through the night, 7 secrets to better naps, and how to help your toddler sleep better, with our free guides. And each of our free e-Books come with a blank sample sleep plan as well; this sample gives you a sneak peek at exactly what our signature Personalized Sleep Plan® looks like. Simply enter your email address, and your free sleep guide will be available for immediate download – no strings attached! A great sleep and feeding schedule for your baby or toddler can go a long way towards improving sleep. But what does the ideal baby or toddler sleep and feeding schedule look like for your child? 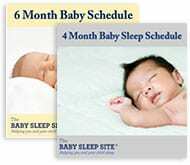 Our sample sleep and feeding schedules can help! Use them as a template to create a great, sleep-inducing schedule – or, use them in combination with our schedule-maker tool to create a customized sleep schedule based on your baby or toddler’s age and usual morning wake-up time. Our baby and toddler sleep blog is updated weekly with new, full-length articles on your most pressing sleep issues. In our articles, we cover everything from gentle methods to help your newborn sleep, to extending short naps, to methods to help your baby sleep through the night, to setting sleep boundaries with your toddler – and more! It’s free to read, and free to comment, so why not join our community of readers today, and start your journey to better sleep! In addition to our free resources, we also offer some great do-it-yourself and sleep coaching resources, like our Members Area and our basic e-Book bundles. We also offer personalized sleep consultations that provide you with a sleep plan tailored to fit your baby’s needs, and to help you sleep coach in a way that matches your parenting goals. Explore these options, and get started today!